Send Lilies anywhere in Ireland. Luxurious lilies, with their distinctive markings and delicate petals, are a favourite amongst those with discriminating tastes. 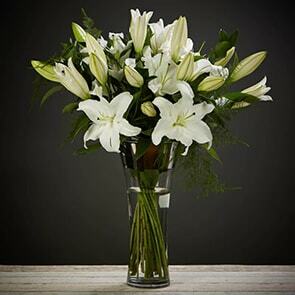 We lavishly layer fresh-cut lilies into many of our arrangements, and hand-tie each bouquet, ensuring the display is simply breath-taking and that it remains vibrant for a full week. 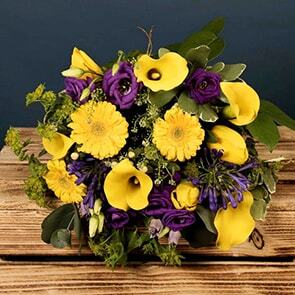 Our next-day flower delivery Ireland and same-day flower delivery Dublin make it possible to have an uncommonly beautiful bouquet on hand anytime you need to leave a lasting impression. 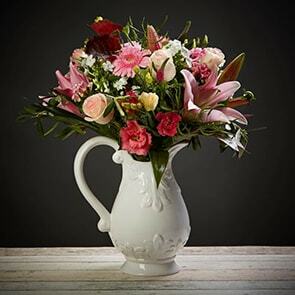 Whether your recipient prefers the bloom on its own or as an accent, you’re certain to find just the right bouquet in our catalogue. We work with Ireland’s best florists to devise bespoke arrangements and uncommon pairings, so you’ll always find something new and exciting, no matter how often you shop for flowers. Each of our designs utilises mindful practices, such as minimising packaging and locally-sourced blooms whenever possible, providing you with a superior offering that lasts an extraordinarily long time. 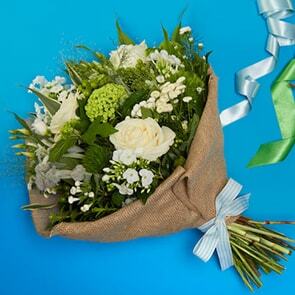 If you’re planning to send lilies as a gift, why not add a little something extra? 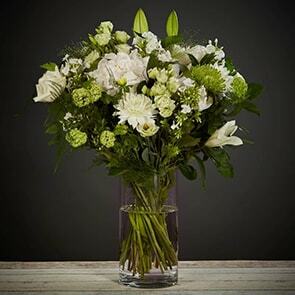 A box of gourmet chocolates or attractive vase will speak volumes about your thoughtfulness. You can also add a personal note to express your warm wishes or another sentiment. When you order flowers from Bloom Magic, you can rest assured that your arrangement will arrive on time and in perfect condition. Moreover, we guarantee that they will remain fresh for a full week after they arrive. Feel free to reach out to us by phone, email, or live chat on the site, should you have any queries at any point in the ordering process or even well after your gift has been received. 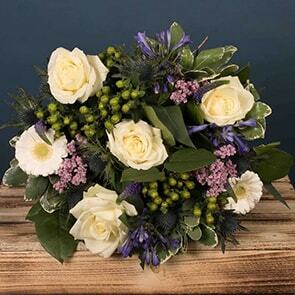 You may also shop our catalogue in total confidence, knowing that we’ll begin piecing together the perfect bouquet and deliver it straightaway upon your request.